What a fun basket! 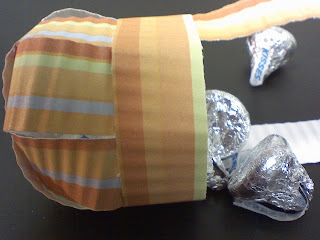 I know another 3D item- these baskets were for coworkers and they have some kisses in them. I honestly cannot believe the picture isn't more clear.. my apologies! and now that they are gone.. RIGHT? I had one person ask my why there wasn't grass in them, and first of all, I CANNOT STAND THAT STUFF... then when I made my 'own' with shredded paper, I didn't like the look of it. Hey maybe they wanted 'grass' instead of the chocolate kisses in them?? I could have done that, I mean, I put about 8 kisses in them. I am sure you could almost fit a dozen. 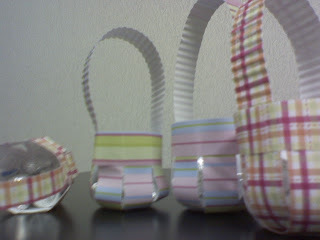 Anyways- my family's baskets are different than these, and with all hope, I will get them posted shortly after the holiday. If I do not get back here until then, have a great safe holiday!